From left to right: Alex, Casey, Jackie, Justin, and Imran. Five graduate students in the MS IT program made poster presentations at the UNH Manchester Graduate Research Conference on April 25, 2012. Recognizes the undergraduate student who has demonstrated consistent achievement in the Computer Information Systems major and overall academic excellence. The UNH Graduate School Manchester Campus is hosting a “Technology Graduate Programs Information Session” for the Management of Technology (MS MOT), Information Technology (MS IT), and Software Systems Engineering (Certificate) graduate programs. Program representatives will be available to answer questions at the Manchester location on Tuesday, February 7 at 6 pm. 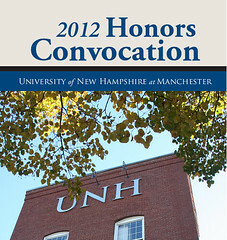 The University of New Hampshire Graduate School, Manchester Campus offers post-baccalaureate programs in applied professional fields. Centrally located in Manchester’s historic Millyard in the heart of the I-93 corridor, the Graduate School offers the expertise of University of New Hampshire faculty, contemporary curricula, modern educational facilities, convenient access, flexible schedules, and most important, a graduate degree from the University of New Hampshire, the state’s flagship public university.